Coming into Saturday’s game at Miami, Syracuse was in desperate need of a quality win for their NCAA Tournament hopes. The Orange (18-9, 7-7 ACC) got that win, using a 9-2 run just past the midpoint of the second half to build up enough of a lead to withstand the Hurricanes (18-8, 7-7), 62-55. The victory is the sixth in the last nine games for SU. As has been a major key to their success all season, the Syracuse defense was stifling, allowing Miami to shoot just under 34 percent overall and just 22.6 percent (7-for-31) from deep. The Orange also did a good job cleaning the glass, as they held a 37-29 edge in rebounds. Perhaps most surprising was how effective the SU offense was in the second half. After shooting under 37 percent and scoring only 25 points in the first half, Syracuse rolled up 37 points on only 27 possessions (1.37 pts/possession, about 30 percent better than their season average), powered by shooting 63.6 percent from the field. The Orange got off to a slow start, mustering only one basket in the first five-and-a-half minutes of play. Tyus Battle kicked the offense into gear with a left wing three-pointer, then got a floater in the paint to skid in for the first SU lead of the game. After the Hurricanes got a three to go back in front, Syracuse notched nine of the next ten points. Frank Howard dropped in a floater for a 9-8 lead, then Oshae Brissett took over. Brissett swooped in from the left corner for an authoritative slam, then buried a three from the left wing after a Miami foul shot. The freshman then made it seven straight points by tapping home his own miss for a 16-9 Orange lead with just over eight minutes left in the half. A couple minutes before intermission, the ‘Canes rattled off seven unanswered points. The burst put them back in front at 21-20. Shortly after that, Howard got a floater to bounce through and went the distance with a long rebound for a finger roll to put SU back on top, but a pair of Miami foul shots made it a 25-25 game at the break. 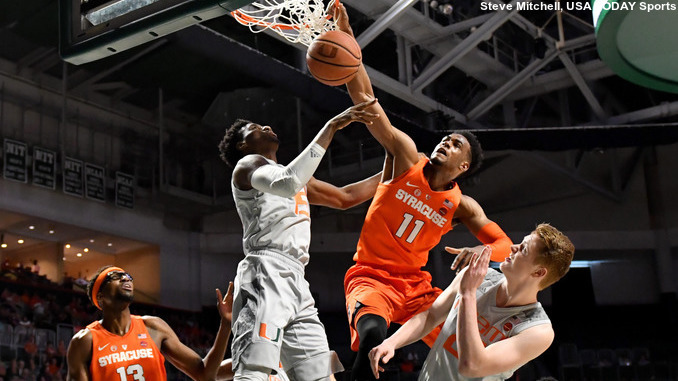 The Hurricanes got an early three to start the second half, but Howard continued his strong play by being involved in all 15 unanswered Orange points in a span of just over five minutes. The junior point guard connected on a floater to start things off, then dropped a bounce pass to Marek Dolezaj, who swished a jumper from the left side. Howard then lobbed the ball to Paschal Chukwu, who collected the pass and dunked, and the next SU score came when Howard fed Battle on an inbound pass for a short jumper. Howard then got a little more directly involved, swishing a triple from the right side and rattling home a floater from the left. After missing a shot on the next trip, Howard dished to Dolezaj for a short push shot on the left baseline. All told, Howard amassed seven points and four assists as Syracuse leapt out to a 40-28 lead. Miami had a strong response, capping a 15-3 run with nine straight points to tie the game once more. With just under ten minutes on the clock, the scoreboard read 43-43. The Orange, though, calmly responded with another run, this one a 9-2 advantage, to grab control. After grabbing an offensive rebound, Dolezaj slipped a behind-the-back bounce pass to Brissett for a lay-in and the lead. Howard kept clicking, as he leaned in after a fake to hit a shot while drawing a foul, and added the free throw for a five-point lead. After a Miami basket, Howard swished a jumper while straddling the three-point arc and Brissett closed the streak with a scoop that bounced high of the rim, then dropped in. The good fortune gave SU a 52-45 lead with under 5:30 left. The Syracuse offense managed only one basket in the next four minutes, but their defense hung tough, allowing the Hurricanes to get within three points with just under two minutes to go. Battle came through with a big shot, sticking a pull-up three from the right wing that doubled the Orange lead with under 90 seconds left. After a Miami basket, Battle drew a foul and his second free throw was true, strengthening the lead to 58-53. Following a pair of Hurricane free throws, Dolezaj was fouled on the inbound pass. He sank both ends, pushing the margin back to five. Brissett cleared a missed Miami three and the ball got to Battle, who was fouled. The junior guard drained both ends, closing the scoring with 9.6 seconds to play. After a slow start shooting the ball, Frank Howard turned it on by making seven of his last ten shots to finish with a game-high 18 points. Oshae Brissett logged his tenth double-double of the season, getting most of the way there in the first half. The freshman forward totaled 16 points and 12 rebounds after a nine-point, seven-rebound opening half. Tyus Battle chipped in with 13 points while Marek Dolezaj added 11. Chris Lykes had 14 points to lead the Hurricane attack while Lonnie Walker posted a dozen. Ja’Quan Newton helped out with eight points and Dewan Huell had ten boards to go with seven points. Wednesday night, the Orange will have another opportunity for a big win when #14 North Carolina visits the Carrier Dome. The Tar Heels (21-7, 10-5) come in red hot, having won their last five games. Four different players average double figures in scoring for UNC, led by Luke Maye and Joel Berry II, and all four have made at least 32 three-pointers on the season. Maye averages a double-double of 18.4 points and 10.5 rebounds per game while Berry II adds 17.7 points per game and has connected on 70 triples this year. Wednesday’s game is set to get underway at 7:00pm Eastern with ESPN handling the television duties. The game will also be available online at ESPN3.com.